What happened to Reece Oxford? Did we sell him? @Cuenca: Now I’ve got internet up and running in my new gaff I’m gonna look into what’s going on with Sead. whoscored don’t have any data on the younger squads at Malaga. Vic_Watson wrote: What happened to Reece Oxford? Did we sell him? In fact he's back in the fold. Wearing Mooro's No.6 shirt, he gave a penalty away v Chelsea in the U23 match today. cheers Leon...lauded on here naturally enough going to Malaga but doesn't seem to be involved in the first team according to your stats. The 24-year-old joined the Reds on what was set to be a season-long loan last month. However, Byram suffered a knee injury in the 3-1 Carabao Cup win over Newcastle United a fortnight ago and limped off the City Ground pitch with just 39 minutes gone. It was only his third appearance in the Garibaldi, having previously featured against Bury in the same competition and in the 2-2 draw with Birmingham City in the Championship. The Reds have since brought in Saidy Janko on loan from Porto, to provide cover and competition for Tendayi Darikwa at right-back. Martin played the final minute as Venlo won 3-0 against ten-man NAC Breda. In midweek, Jordan played the full match (his first league start) as Middlesbrough went second with a 2-0 win over Bolton. He assisted the opening goal. 20: Boro want a penalty as Jordan Hugill gets inside his man and goes to ground. The referee isn't interested. 34: A mix-up in the Bolton backline - Jordan Hugill is onto it like a shot and tees up George Saville for his first Boro goal! Yesterday, Jordan played 21 minutes as Boro drew 0-0 with Swansea. He was cautioned deep into injury time as Boro chased a winning goal. Edi played the full match in midweek as Fiorentina drew 1-1 at Sampdoria. He completed 15 of his 20 passes (75%), made 2 successful passes and earned a rating of 6.33. He was an unused sub in yesterday's 3-0 victory over SPAL. Josh played as Charlton came from behind to win 2-1 at home to Plymouth. 44' Cullen breaks up a Plymouth attack on the edge of the box brilliantly. 69' Cullen's potshot from range is off target. Last edited by LeonRivers on Sat Sep 29, 2018 4:14 pm, edited 1 time in total. and as you so correctly point out, he's not in the match day squads at all..
Martin was named man of the match as Venlo won 3-0 at third-division Westlandia, scoring in each half - his first goals for the club. The first was a beautiful curler from outside the box. The second a tap-in at the far post after a corner evaded everyone.
" It was a strange thing to have to play on a Tuesday evening. In addition, VVV started with a number of players who are not in the base in the Eredivisie matches. 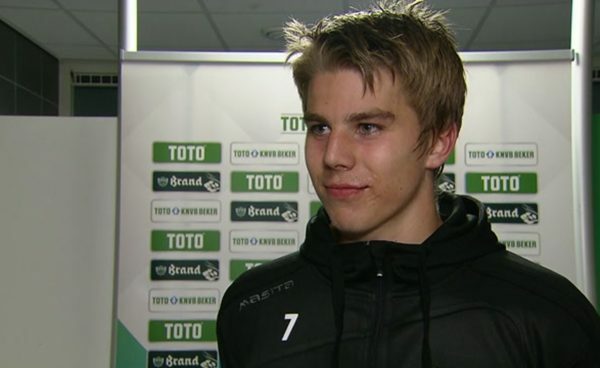 Nevertheless, VVV-Venlo was a lot stronger of Westlandia with especially a strong Martin Samuelsen. He was also the creator of the first two goals, but they said that they came about only after 6 different attempts. The 0-1 was a brilliant bang out of 16 and that went straight to the cross. Samuelsen's second goal was a lot less beautiful, but he was well against a cross, after everyone missed him. For example, after an hour of play it was 0-2 for the Venlo-team. Sovereign." Edi played 64 minutes as Fiorentina lost 2-1 at Inter. He was withdrawn with the score at 1-1 after a caution in first-half stopage-time. He completed 18 of his 23 passes (78%), but was dispossessed 3 times. Martin played the final 11 minutes as Venlo lost 1-0 against ten-man Excelsior. He completed 3/3 passes and was awarded a final match rating of 5.9 by whoscored.com. Jordan played 76 minutes as Middlesbrough drew 1-1 at Hull. He played 65 minutes in midweek as Middlesbrough won 2-0 at Ipswich. 65: Jordan Hugill's last action is to send another shot just wide. Great shift from the forward, now Britt Assombalonga's time to shine. Toni played 17 minutes as Rayo lost 1-0 at Malaga. Edi played 57 minutes as a sub as Fiorentina beat Atalanta 2-0. He had one blocked shot, completed a disappointing 11 of 18 passes (61%) and earned a rating of 6.28. He was cautioned in stoppage time. 33' Substitution for Fiorentina. Edimilson Fernandes replaces Marco Benassi because of an injury. 43' Attempt blocked. Edimilson Fernandes right footed shot from outside the box is blocked. Assisted by Marko Pjaca. 90+2 Foul by Edimilson Fernandes. 90+2 Edimilson Fernandes is shown the yellow card for a bad foul. Josh played as Charlton left it very late to draw 2-2 at Luton and extend their unbeaten run to 6. He was booked in the second half for a foul on former team-mate Elliot Lee. 72' The corner comes to nothing as Fosu tricks his way out of the corner and Cullen wins a free-kick. 78' Cullen booked for a foul on Lee. He then played in midweek as Chalrton's unbeaten run was ended with a 3-5 defeat to in-form Scunthorpe. His corner lead to Charlton's first goal. 18' Sarr headed a Cullen corner back into the danger zone and Taylor rose highest to nod home! 42' Cullen sends a free-kick into the box and Alnwick punches it clear. Josh Cullen is the star of Saturday’s official matchday programme when Coventry City visit The Valley on Saturday. The midfielder, on loan from West Ham United, has enjoyed a bright start to life in SE7 and he features as the main interview in which he discusses how his previous loan spells in League One serve as motivation to achieve promotion this time round and how he is learning off his new manager, Lee Bowyer. Is Browne injures? His minutes appear to have dried up completely. thejackhammer wrote: Is Browne injures? His minutes appear to have dried up completely. Haks getting no minutes either....Ex referenced financial issues at the club he’s at is the cause..is that common knowledge ? Loftyhammer wrote: Haks getting no minutes either....Ex referenced financial issues at the club he’s at is the cause..is that common knowledge ? There is talk on the forums about the Qatari sheikh owner buying player/players against the managers wishes, despite FFP being an issue. Marcus returned from injury to play 16 minutes in the Checkatrade Trophy as Oxford Utd lost 2-1 to Northampton Town. 74' SUBS for United: James Henry is replaced by Marcus Browne and Jamie Hanson goes off for Jon Obika. 89' Browne picks up the ball on the left, cuts inside and his venomous drive goes wide of the far post. Jordan played 60 minutes as Middlesbrough lost 0-2 at home to Nottingham Forest. He left the field between the two goals. Edi was introduced at half-time as Fiorentina lost 1-0 at Lazio. He completed 27/33 passes (82%), won 1 tackle and 2 aerial duels. He was awarded a match rating of 6.23. 45' Substitution, Fiorentina. Edimilson Fernandes replaces Marco Benassi. 55' Hand ball by Edimilson Fernandes. 63' Corner, Lazio. Conceded by Edimilson Fernandes. 79' Foul by Edimilson Fernandes. Josh played as Charlton lost 2-1 at home to Coventry. 67' Charlton break as Cullen finds Grant who bounds into the box, but sees his effort blocked. He was not involved in the midweek Checkatrade Trophy match as Charlton rewrote history with their biggest ever win, an 8-0 success at Stevenage. I thought Sead H has looked good whenever I've seen him. Strange he's out of the picture currently. I'd like to see him back like someone else said in the U23s and playing in the cup games etc. He's always looked quite tidy when I've seen him. not accomplishing anything there that he couldn't I imagine do here. the under 18's put out 3 schoolkids the other day iirc, due to the u-23's training with the first team squad and the u-18's supplementing the u-23 squad. he could help out plus Pellers get a proper look, or maybe he has had and there isn't any future here for him. but he's hardly being put in the shop window out there is he ? if he's not getting game time, they probably ain't interested in buying him so Shirley he's be better off here with us or with a Fizzy/League 1/League 2 outfit with a view to moving on. Sead Haksabanovic impressed for Premier League outfit West Ham United in pre-season but Manuel Pellegrini sent him to Malaga. The Montenegrin international failed to make a single Premier League appearance in his debut season last year since his £2.7 million move from Halmstad. But, after starring over the summer, many West Ham fans were hoping that the 19-year-old would be handed his chance to impress by Manuel Pellegrini. But the veteran Chilean obviously believed that Haksabanovic was better off elsewhere. According to Marca, Pellegrini was the driving force behind the attacker joining his former club Malaga on loan. Not that the teenager has made the impact West Ham would have hoped for in the Spanish second tier. Haksabanovic has not been included in a single match-day squad since moving to Malaga. And, according to El Desmarque, Haksabanovic has rejected the chance to link up with Montenegro over the international break in order to win over Malaga manager Juan Muniz – a decision that has impressed the 49-year-old. “Everyone likes to play for the (international team). He has taken a step forward in his adaptation,” Muniz said. Malaga have impressed in the absence of Haksabanovic, however, sitting top of Spain’s second tier with six victories out of eight. So why change a winning formula?